First things first, you need to find the images that you want to use. You could draw them out yourself but I just google searched different things and picked the ones I liked! You'll need to print out two of each design (you will see why later). 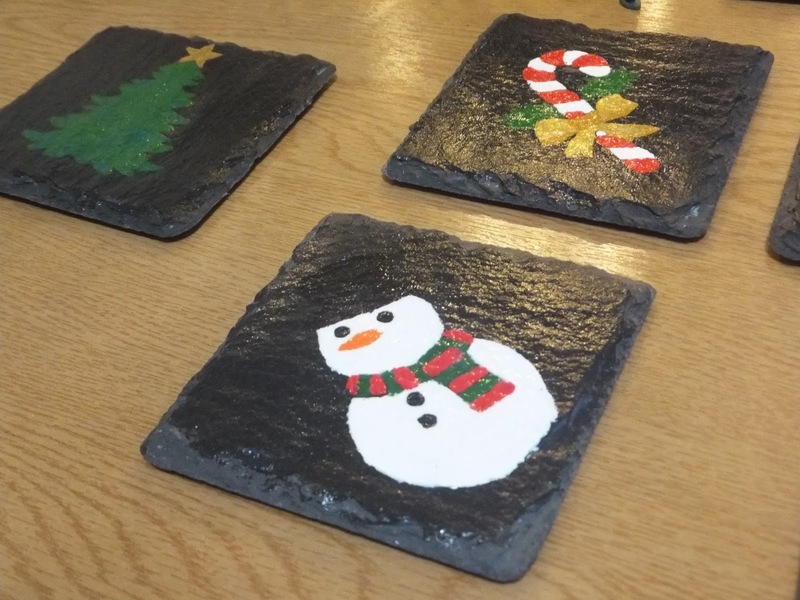 I thought I'd show you three different designs which are at different levels of difficulty, so everyone can have a go! 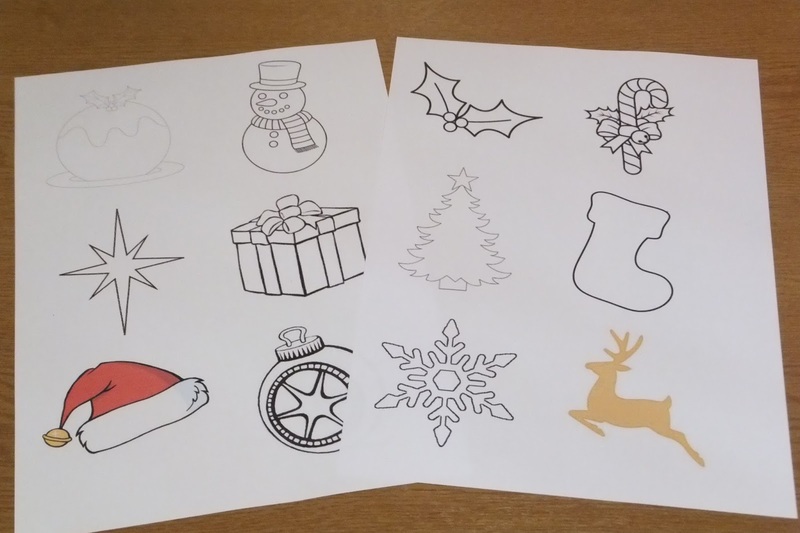 The designs I went for are the star, the present, and the snowman. 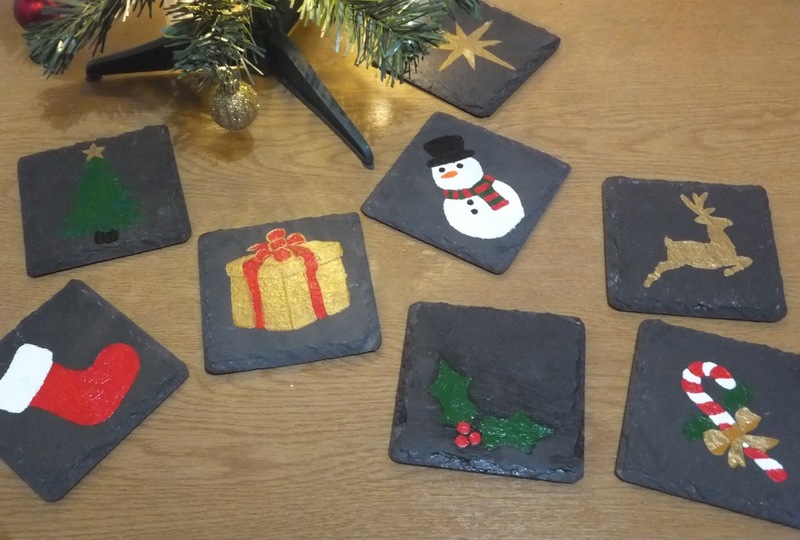 You need to cut out your chosen designs so they are in a square, and once you have cut out the middle of your stencil simply stick these down on the coaster with a bit of masking tape on the sides. 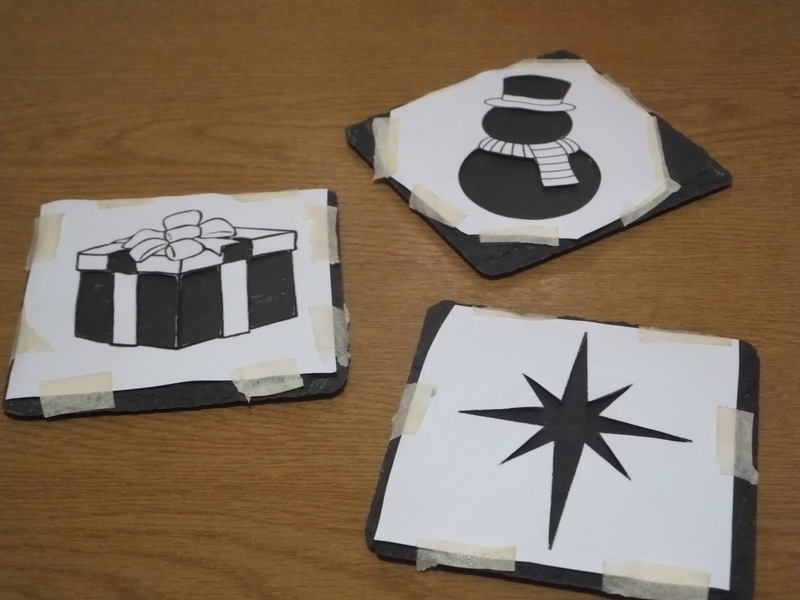 So the easiest of the three is the star, as you simply need to cut out one of the shapes, making it the most straightforward. 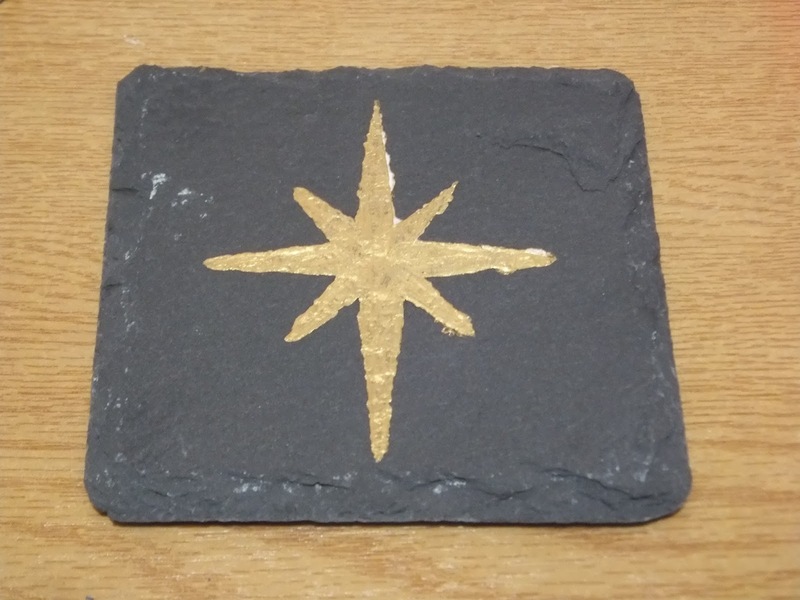 For this one you simply need to choose your colour of paint (I went with gold) and paint out the shape of the star. 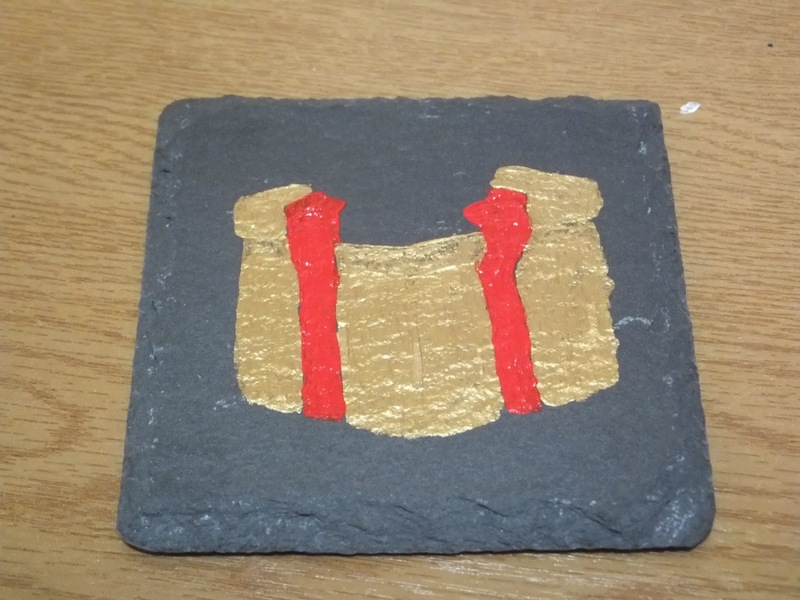 I found it worked better to paint in thin layers as opposed to one big one, as you can see in-between layers where you might need a bit more paint, or might need to add a touch up to the shape etc. 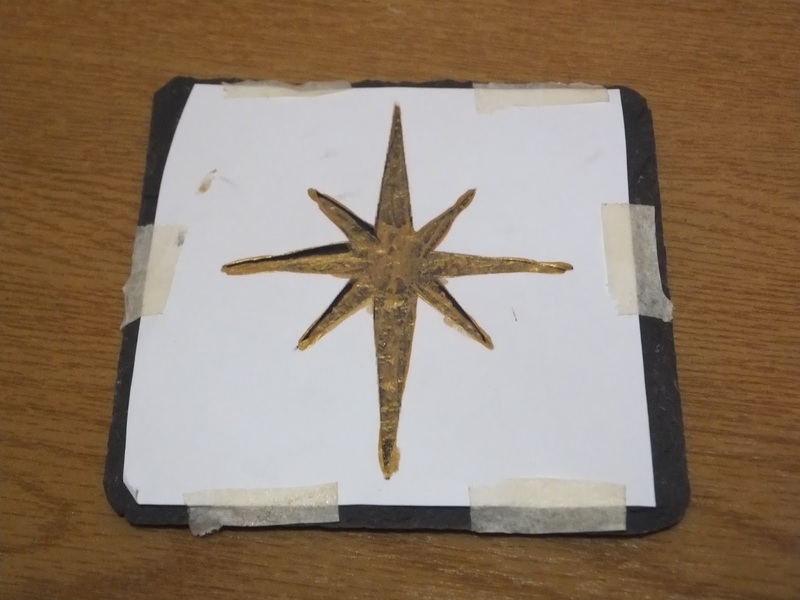 After leaving the first layer of paint to dry and adding another, peel off your stencil. 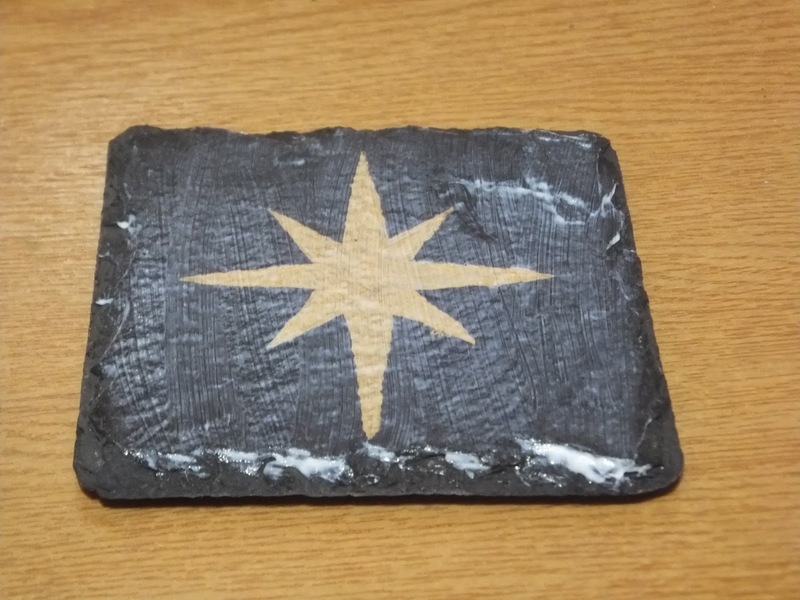 As you can see below the lines of my star weren't perfectly straight at this point, which is fine, as the beauty of acrylic paint means that you can build up another layer. Once the second layer of paint had dried, I went over with a freehand using a small paint brush, to neaten up any lines that looked a bit rounded, or covering up bits that had smudged. 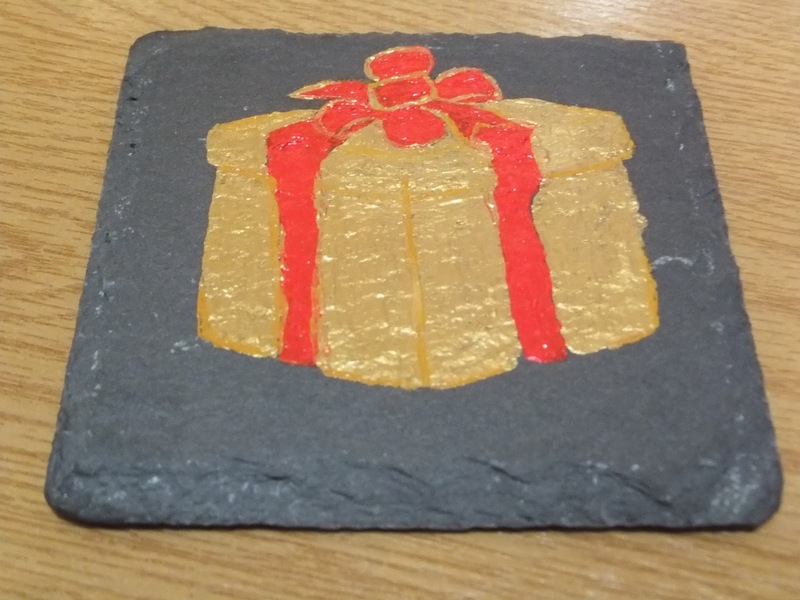 Obviously as it is handmade it's never going to be perfect so just paint it to a point that you are happy with! Leave this to dry. 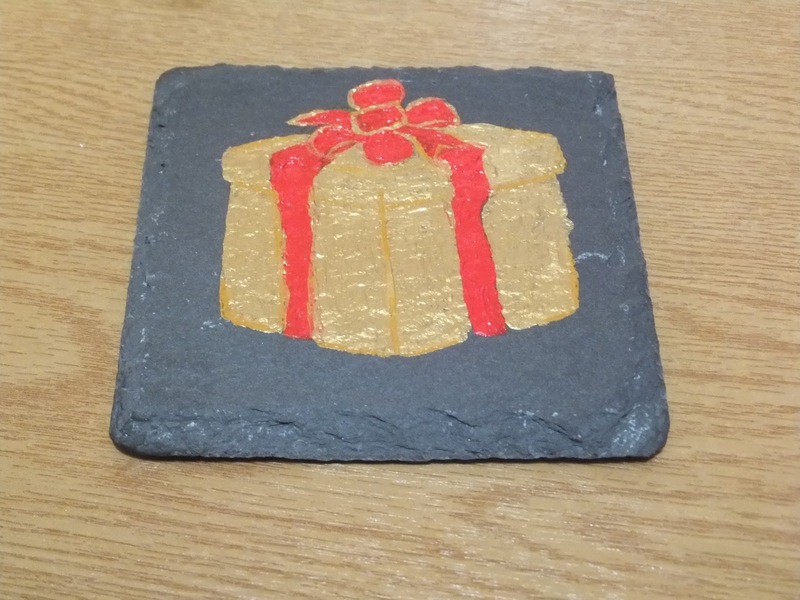 Once all the paint has dried and you are happy with your star, you need to get the gloss gel medium and paint it over the coaster. 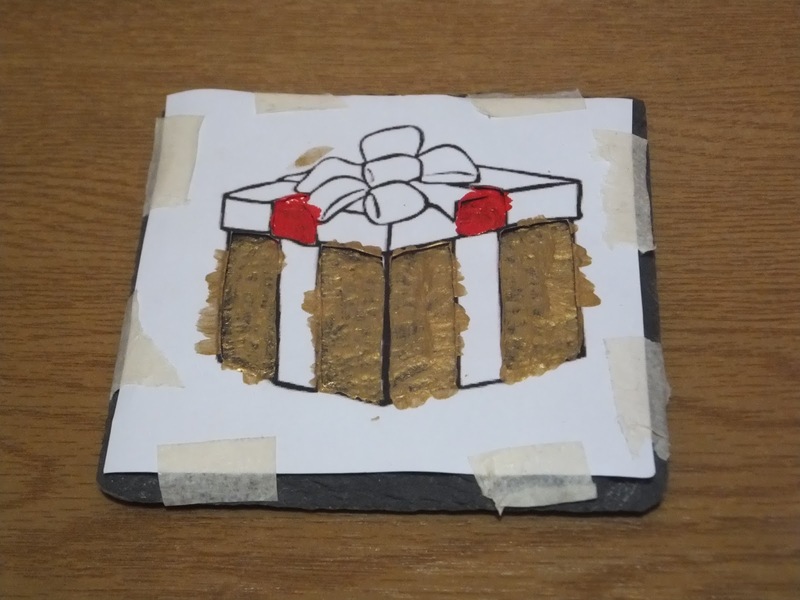 I know this looks a bit scary as the gel is completely white, but you need this to provide a protective layer to the paint so you can use it properly as a coaster. 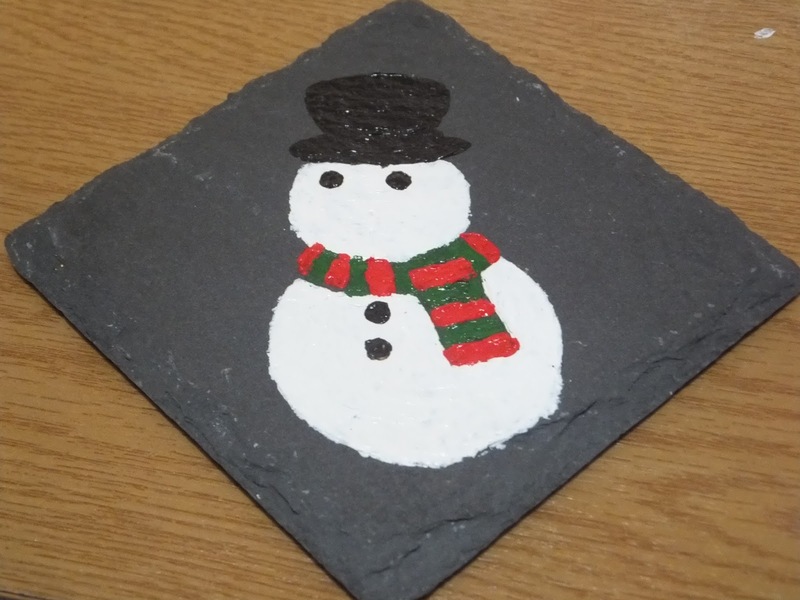 Ideally this will be left to dry overnight and do not fear it dries clear. 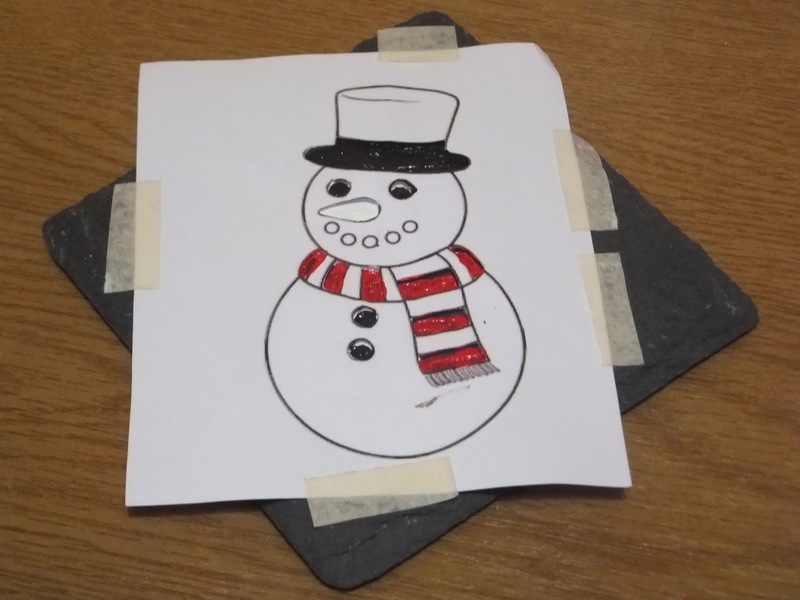 The Snowman is a bit trickier than the star, as you need two stencils for this. 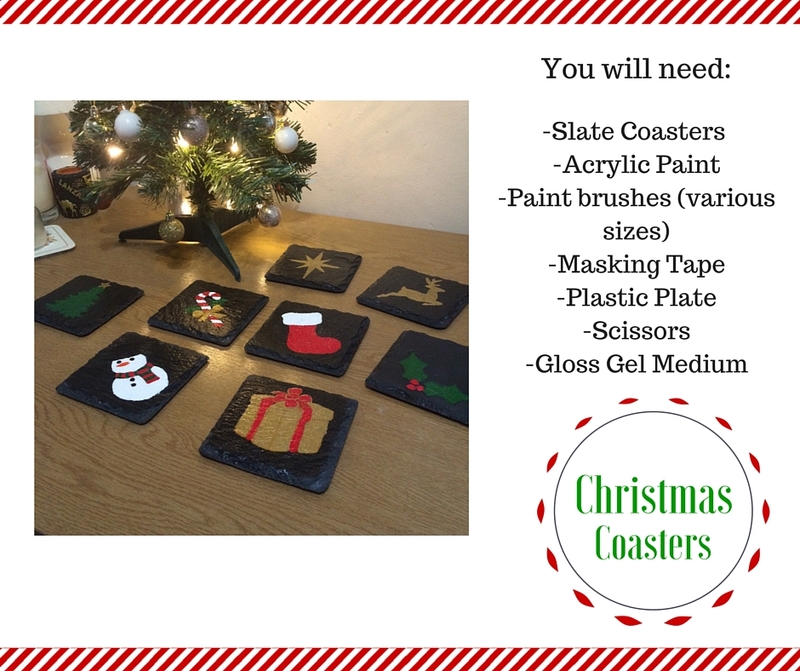 You want to cut out sections so that you have different areas that you can paint. 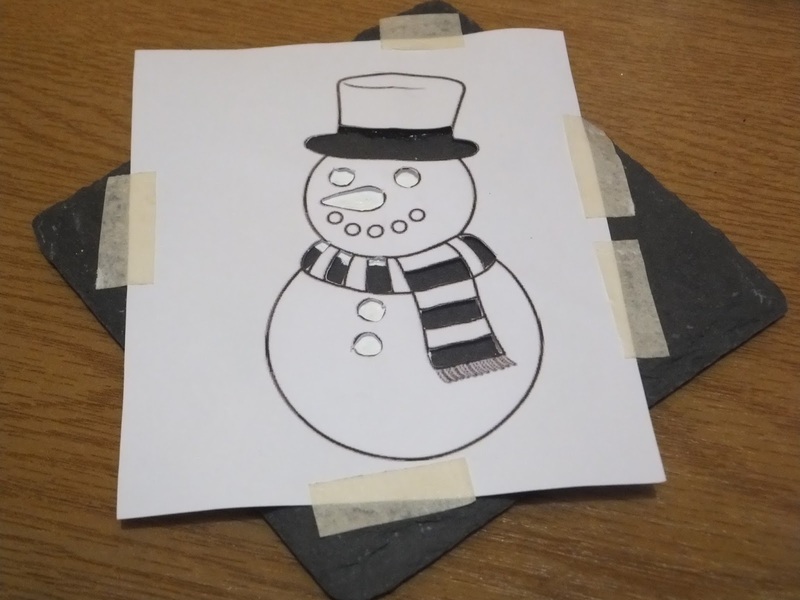 So for example with the snowman, I cut out the main body, head and part of the hat to begin with for the base. 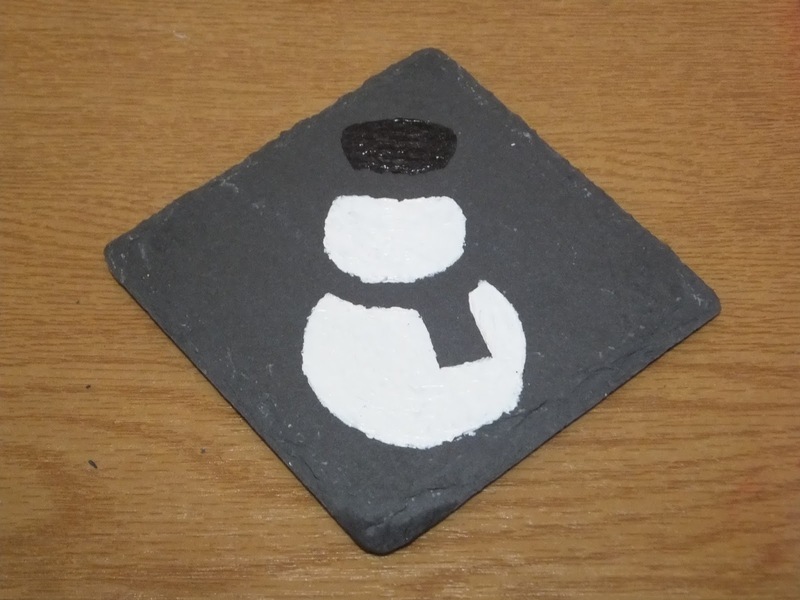 I didn't cut out the whole of the hat as I didn't want the white and black paint to mix, so if you have a barrier in-between you can fill it in once the other sections are dry. 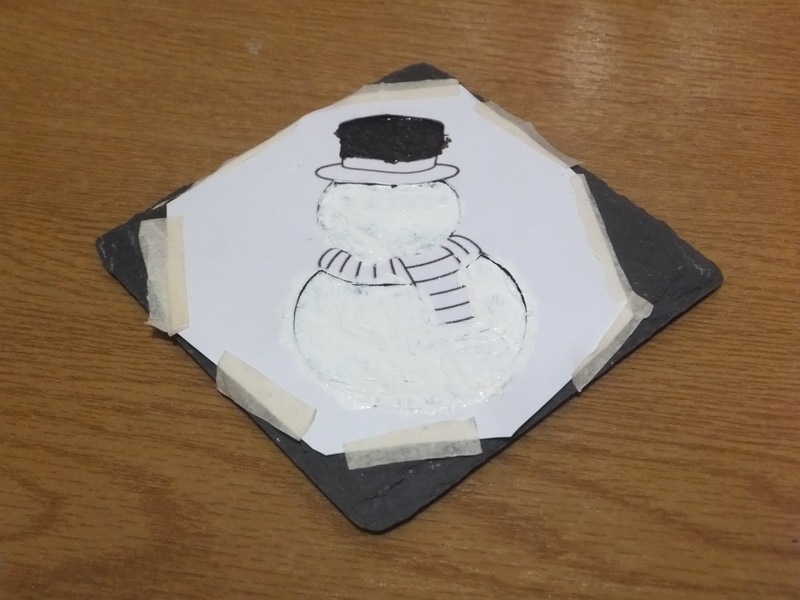 Once you have painted two layers of white for the body and head, and two layers of black for the hat, peel off the stencil and leave this to dry. On ensuring that this is completely dry, you can put your second stencil over the top. So for this one I cut out the rest of the hat, the eyes, nose, and buttons, and with the scarf you could do one block colour but I thought I would show what stripes look like. To recreate the stripes I cut out every other section of the scarf. Now for the second layer of these sections I found that it was easier to peel off the stencil and do it freehand, so I could see properly what shapes the eyes were etc. For the striped scarf you could either go back with the original stencil and cut out the other striped sections, but I found that it was easy enough to do it freehand by simply filling in the gaps. 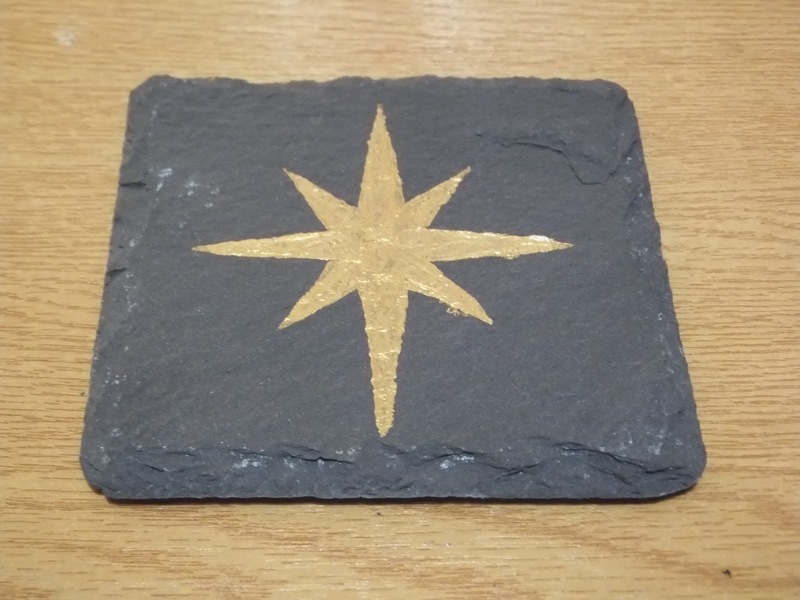 As with the star once you are happy with your design you need to let this dry before covering it all in a layer of the gloss gel medium and leave this to dry overnight. 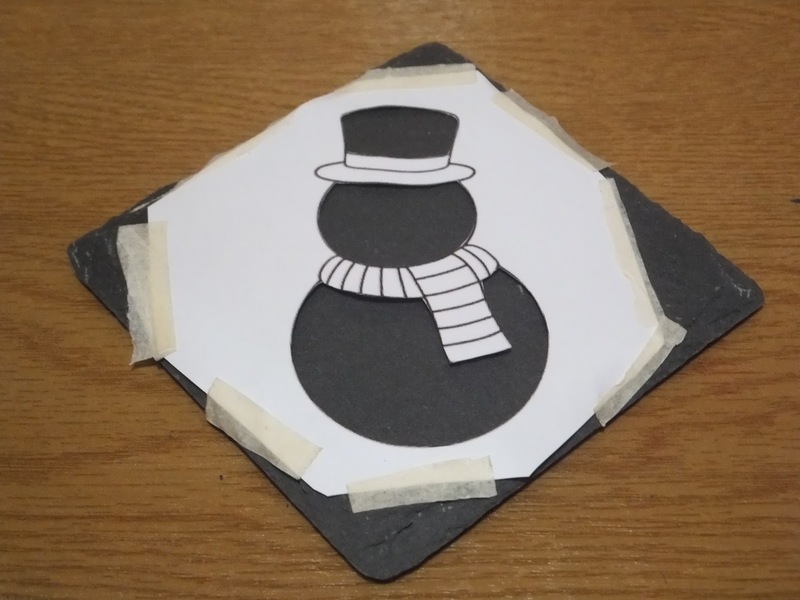 As with the snowman, you need two separate stencils for this design. 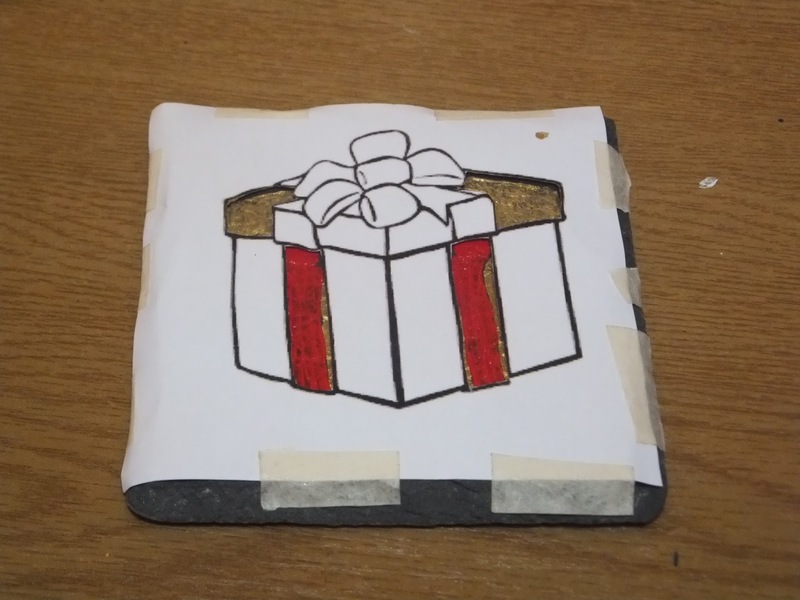 I think it works best if you have two contrasting colours so that you can clearly see where the box ends and the ribbon begins. 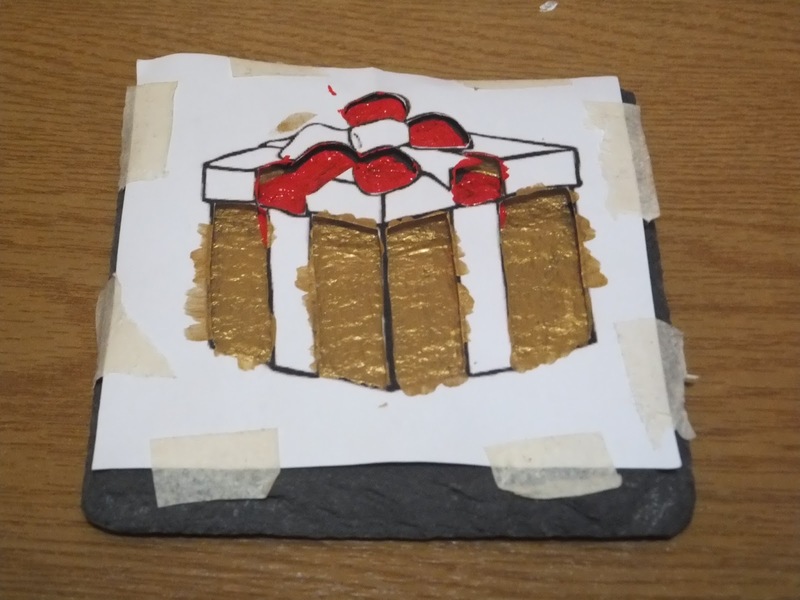 On painting the gold box and bits of red ribbon and leaving this to dry, I moved onto the lid of the box and the rest of the ribbon that was a part of the box (the more complicated bit in the middle is coming!). After you have filled in the rest of the box and the ribbon on the box, peel off your stencil so you can see the progress of the design. As you can see the middle of my box wasn't quite high enough, but I decided to paint the bow before filling this in, as I could then clearly see what needed to go where. For the ribbon I found it easiest to cut out the outside sections, and then fill in the middle with a freehand. Once I was happy with the overall shape of the image, to create definition of the sides I used a light brown that was a similar colour to the gold so as to create shadow. 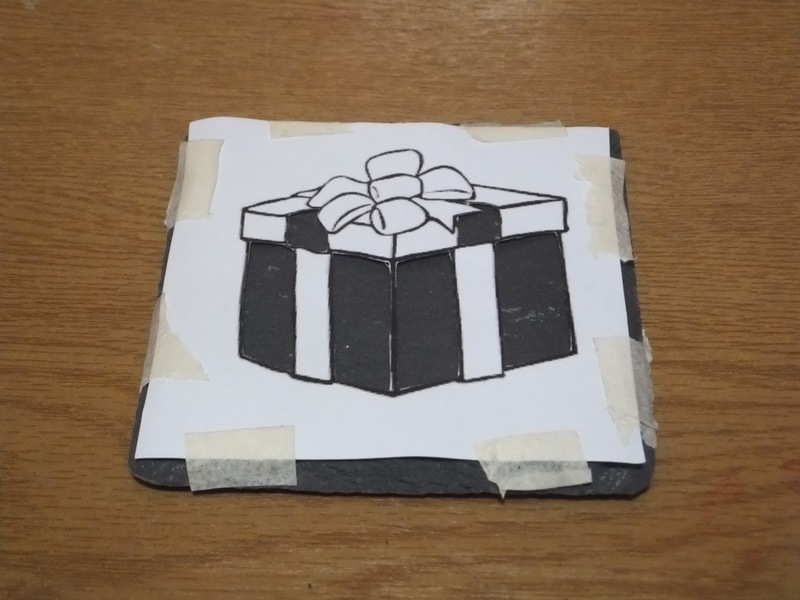 As well as creating shadow on the box, I used this to outline the ribbon so that you could see a proper bow shape! 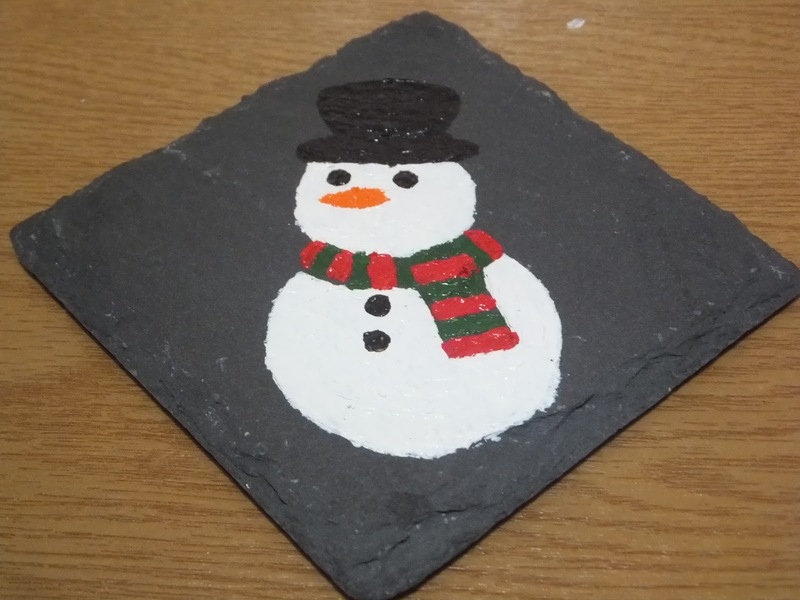 Once you have put enough layers of paint on so that you are happy with your design and this is dry, paint a layer of gloss gel medium over the top and let this dry overnight. As you can see you I made quite a few different designs, and what is great about this is that you can make them unique to you/who you are giving them to. 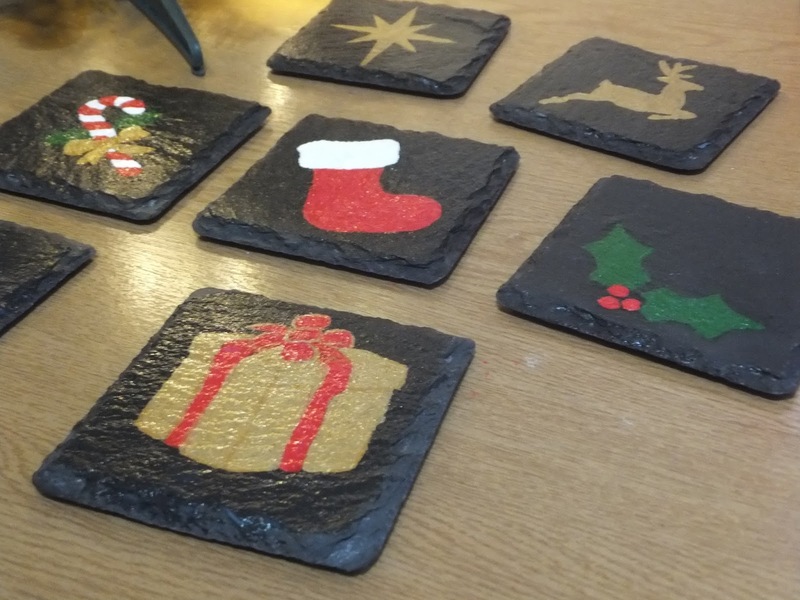 These would be great as decorative pieces, but I can vouch that they definitely work as coasters as I currently have a cup of tea sitting on one. I'm going to be making some more for myself, but also to give as gifts to friends and family! Be sure to come back every Wednesday from now until Christmas to see the rest of my festive series! (And there will still be the usual post on a Sunday too). All links to my social media are at the side, so if you're not already, make sure you follow me so you never miss another post.